Nokia Lumia 1520 is spinning in the rumor mills for quiet some time now, we have seen various leaks showing that Nokia will launch its first phablet device within this month. The company’s official Tmall store -which is an online marketplace in China- recently published a product detail page for the phablet Nokia Lumia 1520. However, the page has no images of the product itself, but the listing shows the same information that we have seen in the leaks lately, 6-inch 1080p display and 20-megapixel PureView camera. 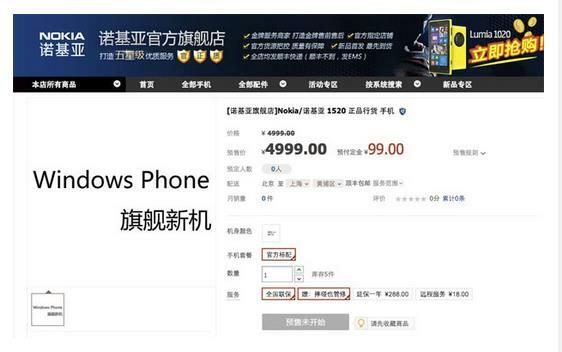 The page also shows a Snapdragon 800 Chipset and the price of the device is shown as 4,999 Yuan (about 50,000 INR) price tag. While this could just be an intentional display of the specs, just like what happened with Nexus 5 when Google accidentally placed the phone on the Play Store. Having said that, the device will supposedly launch at the Nokia World event which is held tomorrow that is 22 October 2013, if interested you can watch the webcast by clicking here.